To help us understand the unusual breeding distribution of Painted Buntings and the evidence of multiple migration strategies, we are working to establish genetic markers that can distinguish different breeding populations and provide insight into their evolutionary history. In molecular ecology, population structure analyses conducted via genetic markers and modern laboratory techniques are increasing our understanding of current ecology, distribution, and genetic structures of many species of plants and animals. We believe that the questions that we are currently attempting to answer using a combination of different tools and methods, including high resolution molecular markers, will be beneficial for understanding the ecology and seasonal movements of the Painted Bunting as well as the management of other species of Neotropical migratory birds. During our Painted Bunting population structure investigation we tried to address the following questions: A) identify connectivity among populations from breeding, molting, and wintering grounds. B) Detect gene flow between apparently isolated breeding populations. C) Understand and infer the demographic fluctuations of the populations in the past. D) Ascertain kinship relations among individuals. Through a collaboration with Scientists at UCLA’s Center for Tropical Research we have carried out mass sequencing by 454 Life Sciences system across a substantial portion of the Painted Bunting genome. 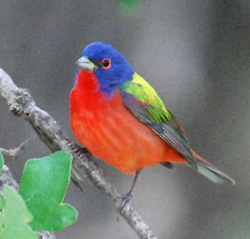 The DNA sequencing performed by 454 Life Sciences technique allowed us to search and target for high variable DNA regions throughout the Painted Bunting genome and yielded high informative primers. In 2011 we conducted a preliminary but intensive molecular laboratory work to obtain a novel polymorphic microsatellites loci library for the Painted Bunting, and we optimized the PCR protocol for the DNA microsatellite genotyping approach following the M13 hybrid primer technique. We adopted the M13 hybrid primer process to reduce the costs and maximize laboratory work efficiency. We have since collected hundreds of genetic samples from Painted Buntings as part of our field work in Oklahoma and Mexico as well as specimen loans from other various institutions to fully resolve the connectivity map across the breeding and wintering range of the Painted Bunting. Furthermore, we hope to match and compare these connectivity results with those data provided by the geolocation dataloggers (i.e. geologgers) and stable isotope analyses. 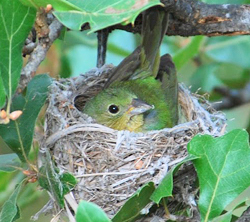 The genetic work allowed us to conduct a connectivity pilot study using the Painted Bunting DNA samples that we collected at Wichita Wildlife Refuge - OK in 2010, and the DNA samples previously collected in Sinaloa, Mexico in 2009. The first allelic richness screening yielded 10 novel informative loci for the Painted Bunting and we used these new loci to address some important connectivity questions. First, we wanted to test via genetic data whether or not the individuals from the breeding populations in Oklahoma migrate to Sinaloa, Mexico for molting. Initial screening at these 10 loci indicates that the Painted Buntings sampled in Sinaloa are not genetically different from those birds sampled in Oklahoma. These findings strongly suggested that Sinaloa is indeed an important stop over site for the Western population of P. ciris.